Coinciding with it’s debut at the London MCM Comic Con, BandaiUK’s official Youtube channel just released our very first look at the upcoming Legacy Blade Blaster release with a short preview demo. Power Rangers Dino Charge Morpher Sounds Revealed-Three More Dino Charge Rangers Confirmed? TokuNation forum member raz has provided an in-depth look at various sound effects contained within the recently-released Power Rangers Dino Charge Morpher. UPDATED WITH COMPLETE LISTINGS! Every sound known is followed by the words Energize, Engage! Unleash The Power! This may be the morphing call for this season but that detail is unconfirmed at the time of writing. The sounds also refer to three more Dino Charge Rangers: a Purple Ranger with Plesiosaurus Power, an Aqua Ranger with Ankylosaurus Power, a Silver Ranger with Brachiosaurus Power and a Talon Ranger with Spinosaurus Power. These are apparently the American counterparts to Kyoryu Violet, Silver, Cyan and Navy respectively. 0. Spino Charger, Engage! Energize! Unleash The Power! Spinosaurus Power Ranger Talon! 1. T-Rex Charger, Engage! Energize! Unleash The Power! Tyrannosaurus Rex Power Ranger Red! 2. Para Charger, Engage! Energize! Unleash The Power! Parasaurolophus Power Ranger Black! 3. Stego Charger, Engage! Energize! Unleash The Power! Stegosaurus Power Ranger Blue! 4. Raptor Charger, Engage! Energize! Unleash The Power! Velociraptor Power Ranger Green! 5. Tricera Charger, Engage! Energize! Unleash The Power! Triceratops Power Ranger Pink! 6. Ptera Charger, Engage! Energize! Unleash The Power! Pteranodon Power Ranger Gold! 7. Ankylo Charger! Engage! Energize! Unleash The Power! Ankylosaurus Power Ranger Aqua! 8. Packy Charger! Engage! Energize! Unleash The Power! Pachycephalosaurus Power Ranger Graphite! 9. Plesio Charger! Engage! Unleash The Power! Energize! Plesiosaurus Power Ranger Purple! 10. Titano Charger! Engage! Unleash The Power! Energize! Brachiosaurus Power Ranger Silver! 11. Dino Cycle Charger! Engage! Energize! Unleash The Power! Deinonychus! 12. Dino Armor X Charger! Engage! Energize! Unleash The Power! Deinosuchus! 13. 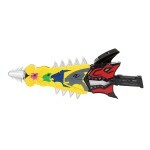 Dino Spike Charger! Engage! Energize! Unleash The Power! Kentrosaurus! 14. Dino Cupid Charger! Engage! Energize! Unleash The Power! Styracosaurus! 15. Dino Blaze Charger! Engage! Energize! Unleash The Power! Allosaurus! 16. Dino Stretch Charger! Engage! Energize! Unleash The Power! Diplodocus! 17. Dino Gas Charger! Engage! Energize! Unleash The Power! Oviraptor! 18. Dino Laugh Charger! Engage! Energize! Unleash The Power! Iguanodon! 19. Dino Squash Charger! Engage! Energize! Unleash The Power! Tapejara! 20. Dino Hypnotize Charger! Engage! Energize! Unleash The Power! Ammonite! 21. Dino Gravity Charger! Engage! Energize! Unleash The Power! Archelon! 22. Dino Helio Charger! Engage! Energize! Unleash The Power! Fukuiraptor! 23. Dino Claw Charger! Engage! Energize! Unleash The Power! Futabasaurus! Legendary! Engage! Energize! Unleash The Power! Go Go Power Rangers! Engage! Energize! Unleash The Power! Happy Birthday! Engage! Energize! Unleash The Power! Happy Holidays! Engage! Energize! Unleash The Power! Charger Special! Engage! Energize! Unleash The Power! Comic Con! Engage! Energize! Unleash The Power! Power Up With Healthy Teeth! Engage! Energize! Unleash The Power! Stay tuned to TokuNation as we keep you up to date on all Dino Charge news! It’s time for another official image dump courtesy of Bandai of Japan! As Kamen Rider Drive hits it’se second month of airing Bandai has seen fit to unveil the selection of November releasing toys! To start this month we have a pair of Tire Koukan releases. TK-03 Drive Type Wild which include the Rumble Dump Tire & the Turning Sword for 3450 yen. And TK-04 Tire Set #2 which includes the Spin Mixer, Mad Doctor, & Dream Vegas Tires 1944 yen. 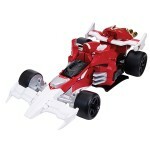 Rounding out the releases for Drive himself is the DX Handle Sword which includes the Type Wild Shift Car for 4200 yen. Switching gears to Machine Chaser we have 2 releases. First up is the DX Break Gunner with Chaser Bat Viral Core for 3800 yen. Then we’ve got an additional DX Viral Core set which includes Chase Cobra & Chase Spider for 1404 yen! Official Images of ToQGer’s DX DaiKaiten Cannon Now Online! 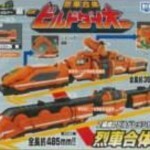 Bandai has opened an official page for Ressha Sentai ToQGer’s latest special item: the DaiKaiten Cannon! This interesting new weapon channels the power of six Resshas into one mighty attack! The DX DaiKaiten Cannon also comes with the super-powerful Hyper Ressha which allows ToQ 1 (and potentially the other ToQGers) to transform into the golden-armor Hyper ToQ form! Hyper Ressha is also shown to be cross-compatible with other DX Resshas and the already-released ToQ Changer. DaiKaiten Cannon & Hyper Ressha will be released on September 13 and cost a mere 6800 Yen. First Official Images of ToQ 6 DX Changer & Weapon Online! We now have our first real look at ToQ 6’s arsenal! 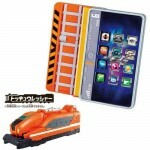 The Orange newcomer transforms using the smartphone-based Appli Changer which is sold with the DX Build Ressha, not to be confused with the larger DX Build Resshas that make up his robo. The Appli Changer is priced at 3500 Yen. 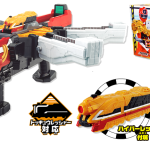 ToQ 6’s main weapon is the Yudou Breaker which includes the DX Drill Ressha. Buying the Breaker will set you back 4200 Yen. Both items should be released by the end of June! Keep an eye on your favorite retailers if you want to add these to your collections! New ToQGer Toy Catalog Scans: BuildDaiOh & Legacy Resshas! The latest round of ToQGer toy scans is now online! In addition we see four new Legacy Resshas from previous Super Sentai teams: Gokaiger, Goseiger, Shinkenger and Go-Onger Resshas! Last but certainly not least we get a quick look at a new weapon for the ToQGers- the “DaiKaiten Cannon,” which fires multiple Resshas by rotating new tracks into attack form. The Daikaiten Cannon will be sold with a special golden repaint of the Red Ressha. Definitely a lot of good things coming down the tracks from ToQGer! 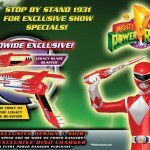 Super Megaforce Official Images from New York Toyfair! The Turbo Falcon Megazord is Bandai of Americas version of the DX Machalcon from Kaizoku Sentai Gokaiger. The BOA release can not only combine with the Legendary Megazord but also has it’s own unique Megazord mode! 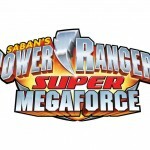 New Power Rangers Super Megaforce Toy Listings from Entertainment Earth! Several new listings for Power Rangers Super Megaforce toys have just come online! *Three more Cycle Zords from older shows: Turbo, Operation Overdrive and Jungle Fury. For full listings with prices & preorders, please check out the Entertainment Earth catalog!